RUSH: I mentioned this yesterday. 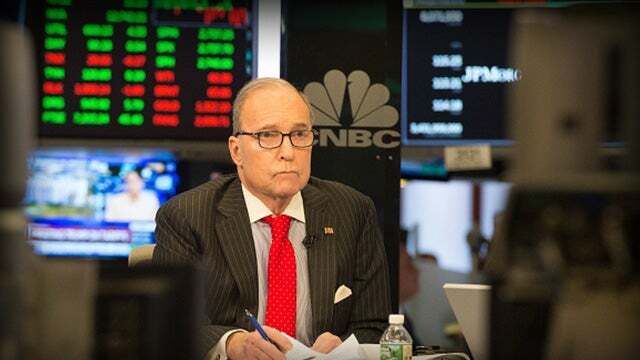 When Larry Kudlow, who used to work at Bear Stearns, Larry Kudlow has been on the street. Larry Kudlow has been a trader. Larry Kudlow has been an executive at a Wall Street firm. Larry Kudlow understands what all happens in the markets. He happens to be a free market conservative. Some people think that doesn’t jibe with Trump being a protectionist. If you look at Trump’s tax cuts, you see nothing but free market trickle-down, and there’s not a thing in the world for Larry Kudlow to disagree with there. On trade policy and tariffs, Kudlow may not be on the same page as Trump. But Trump likes Kudlow and obviously trusts him. If you have somebody that you disagree with or disagrees with you but realizes they are subordinate to you and you still like them and they know when to shut up, they know after they’ve given it their best shot to persuade you, and if they don’t succeed, they shut up and they go away. Apparently Gary Cohn didn’t. He just kept working at it and trying to undermine Trump here or there, like apparently Tillerson was trying to do. Well, that’s gonna get you in trouble with any boss. I think Trump actually was amazingly patient with some of these people. But there’s another aspect of this. 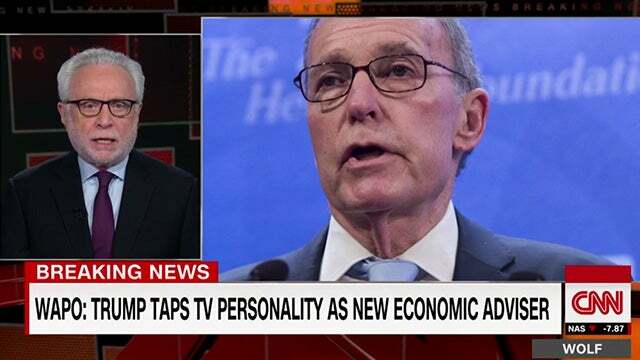 I made mention of the fact yesterday that CNN all day long had a chyron graphic on the screen that said, “President picks TV personality to head up Council of Economic Advisers.” It was an obvious put-down to Trump and Kudlow: TV personality. Well, CNN’s got nothing but TV personalities. I’ll guarantee you every one of them thinks they’re more qualified than Trump to be president! I mean, these people end up ridiculing their own industry. What are they doing? If these people aren’t serious, if they’re not worth listening to, if they don’t know what they’re talking about, then why should we watch them? So if Trump is gonna pick one, an expert in economics who happens to be on TV and CNN’s gonna lampoon it because the guy’s on TV, would somebody explain to me why we’re watching anybody on TV if they are so unqualified? If being on TV is what disqualifies you. Well, let’s look at some of the people the brilliant and gifted Barack Hussein O put in serious positions. A, we have this misguided belief that a bunch of egghead Ph.D’s who’ve never been anywhere but the faculty lounge or the classroom are somehow eminently qualified to work in the United States government, to be cabinet secretaries, members of the economic advisers, the National Security Agency. In the Obama administration, there wasn’t a one of them that had ever met a payroll. There wasn’t a one of them that had ever been a CEO. There wasn’t a one of them that had ever worked in the private sector, and yet they knew better than anybody in the private sector how to do health care, for example. There wasn’t a one of them. They may have had some advice from Zeke Emanuel, but Obama thinks he’s the most qualified guy to run and administer and design the American health care system, and he doesn’t know the first thing about it! He doesn’t know who does what even if a hospital. And yet we acknowledge that people like Obama are brilliant. So he’s got a bunch of these egghead Ph.D.s with degrees in who knows what that have never actually been in the real world. They’re lounge lizards, faculty lounge, classroom dwellers, or they’re at the faculty club for whatever goes on in there. How many of these great, brilliant Ph.D’s were running the Vietnam War? How many of these great Ph.D, these brilliant people that worked for Clinton gave us the subprime mortgage crisis, along with the people working for Obama? This is one of the greatest myths is that if you don’t come from the pipeline of Harvard and Yale and Brown and elsewhere in the Ivy League, then you’re not qualified to work in government, that the Ivy League is essentially the training school. It’s where you learn to act. It’s where you make the friends that become your network. It’s where you learn to dress. It’s where you learn to speak. It’s where you learn to become an establishmentarian. You don’t have to know anything. You don’t have to have any common sense. You don’t have to have any real-world experience. All you need is the pedigree from one of these universities. And then these liberal Ph.D’s who are real world lightweights end up being treated like geniuses. They’re so much smarter than we are, folks. They’re so much better than we are. And they care about people, which is the biggest myth of all. Ben Rhodes, deputy secretary, deputy director of the national security administration, president’s national security advisers, Ben Rhodes. Do you know what Ben Rhodes did with his life? Do you know who he is? He is a creative writing expert. His education is in literature. And this guy’s running second in command national security apparatus for Barack Hussein O. His brother, David Rhodes, is running CBS News at the time Obama is in the White House. I could go down the list of the numbers of people in the Obama administration and what their degrees are in and where they have not worked and real-life world experience they do not have. Obama himself, I’m telling you, is a private sector lightweight. Barack Obama resented it. The one job that he had in the private sector, he wrote about it in one of his two books. He hated it. He felt like he was in the enemy camp when he was at a law firm somewhere. But what brilliance, what real-world experience did even Obama have? Well, he was elected, so he’s qualified, but what were his real qualifications? What did Obama know about health care that qualified him to run in and commandeer, take over of all of it and transfer it to government control? Ditto the student loan program. Anything they touch, they damage it and in some cases they ruin it. Liberals ruin things. They’re ruining the NFL. They’re in the process of ruining all kinds of things. They’re ruining the immigration system and program in this country. They’re ruining university. They’re ruining education. So against all this, we now move to Trump, and he’s gonna pick Larry Kudlow. And Larry Kudlow is not qualified ’cause Larry Kudlow’s on TV? How about James Clapper’s not qualified because he doesn’t know who the real enemies facing this country are, he thinks they’re us? How about John Brennan at the CIA not being qualified? John Brennan — well, I don’t even want to get into who he is. We’ll leave it alone. The idea here that Trump is a buffoon and therefore anybody he picks is a buffoon and anybody who leaves him is a brilliant guy, like Tillerson’s now a great guy, oh, man it’s a sorrowful thing that we’ve had to lose Tillerson. And now it looks like we’re gonna get rid of the chief of staff, John Kelly. Oh, no. And now we’re gonna get rid of — who is it — Sessions. Oh, no. And then these staffing changes are coming up. And everybody’s talking about how Trump’s finding people that don’t know what they’re doing. All they are is TV personalities. Well, here’s another dirty little secret. Broadcasting is another industry that has been watered down and infiltrated by people who are not experts in it. You look at the number of people that are on any given cable network news show in the daytime or nighttime, and most of them have expertise somewhere else. A lawyer or two is on every damn show being converted into broadcasters, but they have no broadcast training, and it is a specific skill and talent. My point is, you can’t turn on TV and find people who are not experts in something other than TV. That’s why TV is hiring them. People toiling away in the broadcast business are constantly being overlooked. Howard Cosell wrote about this when he talked about the jockocracy. You got all these young people in small- and medium-size markets who are doing play-by-play for baseball and football, and they’re not being hired because as athletes retire, they’re being hired. No broadcast experience whatsoever, and they’re put on the number one team, prime time team, ABC, CBS, NBC, ESPN, while people in the business are overlooked. How many of these people that write columns and stories in the New York Times has ever, ever been in the real world, I mean actually in it? Not on the periphery studying it and writing about it, getting fake leaks from invisible sources? I mean, the idea, the notion of who’s qualified and who isn’t based on who liberals decide who’s qualified and who isn’t. Sorry. I’m not into it, and I’m not buying it.